Living on a tight budget in a Mediterranean climate has completely changed the way we cook. Gone are the days of basing a meal round a large steak, pound of mince or chicken breasts hastily bought on the commute home. We now look forward to the Thursday market where we buy enough vegetables for the week for €5-6 which become the focal point of our meals. In our four weeks here we’ve not used butter or cream or had any meat, other than a few slices of jamón or chorizo. We are ardent carnivores and are surprised at how much we’re enjoying vegetarian meals. 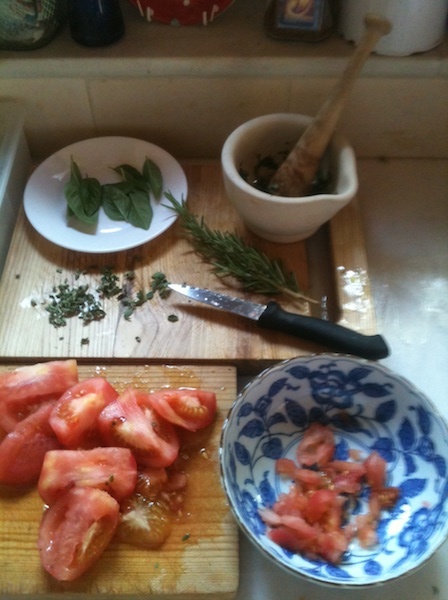 Cooking facilities in the casita are basic but perfectly adequate – and the pestle and mortar is our best friend. It’s a bit like upmarket camping on a gas hob and oven. 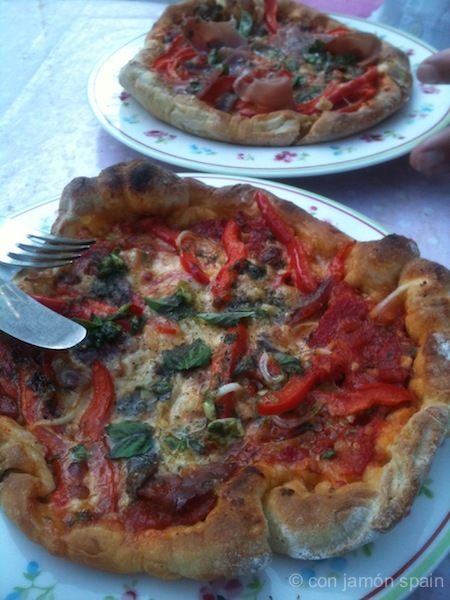 One of our favourites is homemade pizza – made really easy by using ready-mixed Harina ‘pizza flour’. You get really stretchy dough that makes an amazingly thin base – but without the stress of how much yeast to add. We also use it for making naan bread for curries and flat breads for meze meals. Cooking the pizza using a frying pan on the hob and then under the grill works really well – they taste just as good as a wood-fired pizza oven. M reckons they are certainly better than Pizza Express, and as good as the ones here in Órgiva! This recipe makes two small dinner plate-sized pizzas – though it all depends on the size of your frying pan how big you can make them. 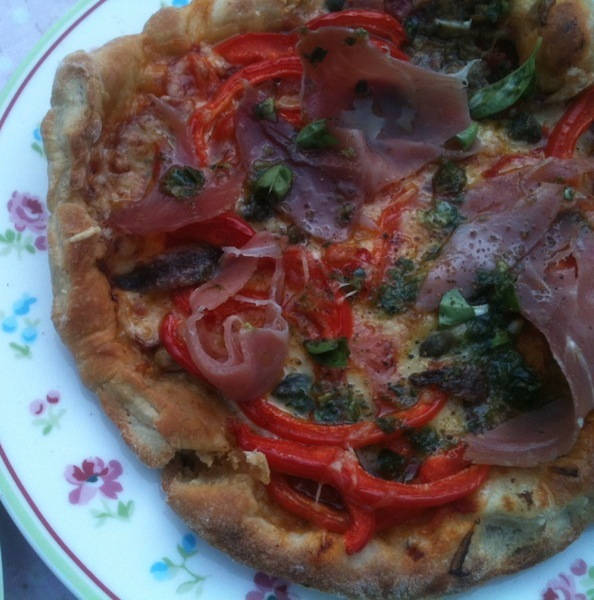 Take a mug of pizza flour (no weighing scales here). Add a large pinch of salt and a large glug of olive oil. Add enough luke warm water to mix into a dough. 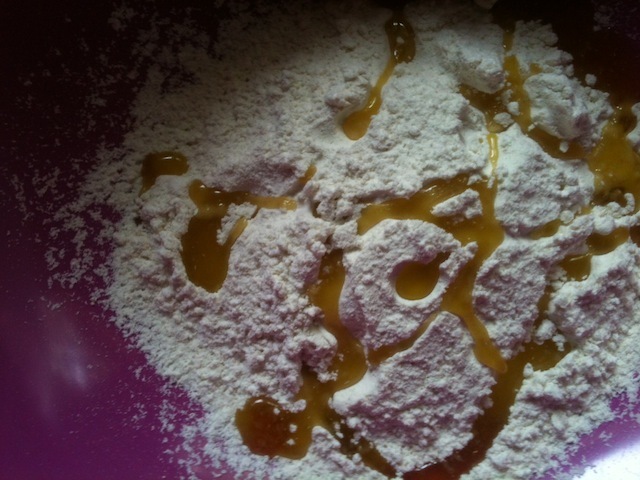 If the dough is too sticky just add some flour. When you have a dryish dough ball, knead it – we’ve never managed the recommended 15 minutes so count 100 ‘kneads’. Make into two balls and leave in the bowl covered with a tea towel in a warm dark place for a few hours to rise – they should triple in size. 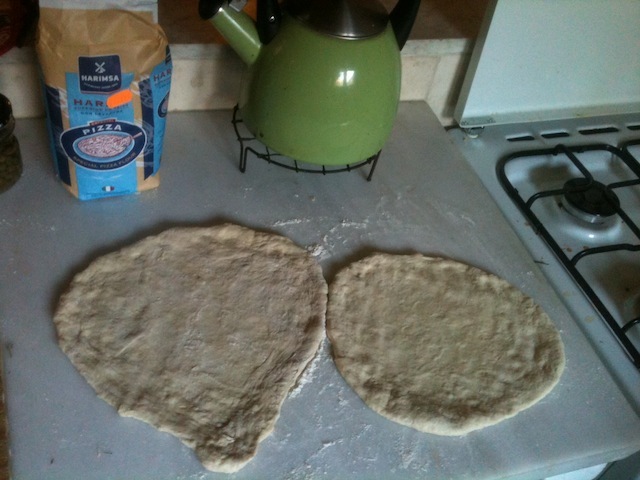 In the UK we would struggle to find a warm place for dough to rise, here it’s easy. Be warned; don’t be tempted to leave out in direct sunlight – it formed a crust which stopped it rising and made it hard to shape. Skin two tomatoes (briefly soaking in hot water makes them easy to peel), chop finely. Mash up garlic, herbs (whatever you have to hand – thyme, basil, rosemary, oregano) with some olive oil, salt and pepper. We do this with a pestle and mortar, so you end up with a lovely paste. Add most of it to the chopped tomatoes (leave a bit aside to drizzle on the pizzas at the end). Finely chop a small onion and add to the tomato mixture. Mash up about ten olives (black or green) with an anchovy. Place a dough ball onto a floured surface and stretch out from the centre using your fingers. Take care not to flatten the edges. Using your fingers rather than a rolling pin stops the edges being flattened and makes them puff up and get crispy – and also helps contain the topping. Once it’s flat you should be able to pick it up between your palms and tentatively stretch it further – it’s amazing how stretchy and thin this dough can get without breaking. Place a dry frying pan on the hob and heat till it’s really hot – then carefully place the pizza dough in the pan. Immediately add the tomato base and the tapenade. Add whatever you fancy; must-haves for us are anchovies, capers and grated cheese. We use Emmental, which is good value. Push it round the pan and when the bottom is browned and looking crispy put it under the grill. Cook for as long as it takes to melt the cheese and it starts to bubble and brown. Before serving up add the remaining herb/garlic paste and some fresh herbs. The result is a thin and a juicy base that doesn’t dry out. Hi Marianne – the make is Harimsa http://www.harimsa.es/ You can just see the packet in one of the photos. It’s about €1.10 a packet. Me too! That looks delicious! Thankfully I nabbed an extra doughnut after dinner – that will have to do for now!